The artwork is very good indeed. If these soldiers had a bad artwork, maybe I wouldn't have bought them. I am not an avid collector of Napoleonic era, and I just have basic knowledge about this era, so, without being able to actually see the figures (I bought them in a shop where I didn't even know if they would have soldiers) the artwork was very important. Congratulations to Mr. Rava, who makes nearly all artworks for Italeri, as this is a masterpiece. All 16 poses are repeated 3 times making 48 figures in total. Detail; Superb, wait, no, more than superb. Wonderful? no, more than that. Anyway, I can spot the triggers on the rifles, you could paint the eyes on the figures, it is just the best detailed 1/72 set I've laid my eyes on. And I have more than 10000+ 1/72 soldiers. They are, some of the few figures which have a very clear and distinguishable faces. Poses; Very curiously, Italeri has decided to give you 3 men of each pose, 3 leaders, 3 sentinels, etc. Which is not ideal but not as bad as you could think. The poses are quite good and realistic, the only criticism is that they are very static, like if they were posing for propaganda photographs, they would look strange in a battle diorama, and they are supposed to be very fast and mobile troops who would be always on the move. The first man in the third row deserves a special mention as probably the awkwardest Napoleonic soldier. He is holding the rifle as he would hold a baby. 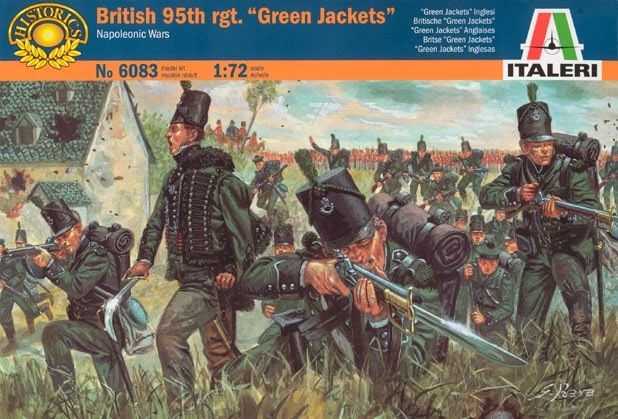 The second man in the third row, is holding his rifle in a very unnatural way, as his hand reaches the end of the rifle. I doubt strongly that this is a confortable pose to fire. Proportions; Very good, heads a bit big, but in overall quite correct. Execution (how the company has made the figures); simply perfect. Flash is absolutely non existant. Zones without detail are very few and perfectly tolerable. These soldiers seem made to have their bases cut off, as they are very small and thin, which will desesperate people like me who doesn't like gluing them into big bases or dioramas, and many the fall constantly. The only solution is to glue bigger stands made cardboard or clear plastic. Besides some small errors in equipment, that as a non-expert I don't notice, these figures are generally right. Detail is very good, so using them to make something different than what they are is strongly not recommended. They are better than the Revell as they have many soldiers with the forage cap, which gives them a very different aspect, at least in my opinion, among so many Napoleonic soldiers which you can hardly distinguish if unpainted. But they lack a bit of life. They look tired. This set would be fine for a regular Napoleonic army, but not for the 95th regiment. For example, making a prone man as in the artwork would have been very appreciated. Many arguments said in the funness aspect comes here too. We can add there is no musician like in the Revell set. They are more or less at 11 €, which is not very good value, considering the 41 men and all the flaws mentioned. Also, two sort of "sentinels", or soldiers just forming, are unneeded in this theme. To paint is excellent, it is a special matte plastic, very unusual (at least my example, I have seen others that look shiny as HaT figures). Gluing is also good. In overall, I like very much these figures. 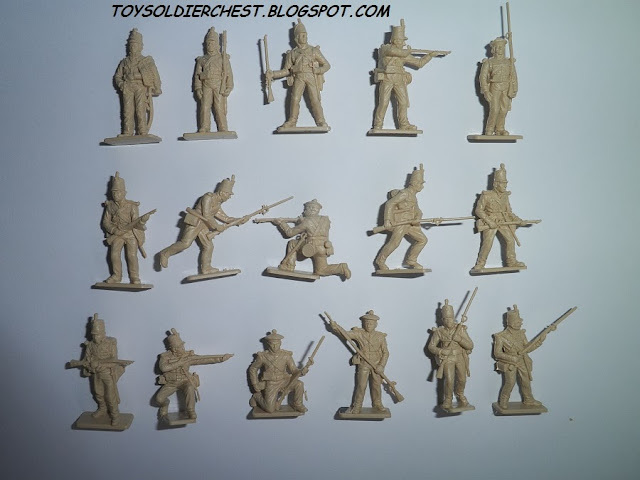 They are different than the usual Napoleonic ones, not one of those 48 forgettable-if-you-don't-paint-them soldiers. The Revell alternative is also very good, and I just prefer these for the men with the forage cap and maybe I would say a bit for the proportions. Conclusion; Excellent attempt at sculpting, weird pose selection. Would I recommend buying them over other alternative sets? ; Yes, but merge both and you will have the perfect representation.